Under the terms negotiated by Congress, the law also includes a new “recapture” provision, which applies only to those employees who receive more than $18,350 in wages during the two-month period (the Social Security wage base for 2012 is $110,100, and $18,350 represents two months of the full-year amount). This provision imposes an additional income tax on these higher-income employees in an amount equal to 2% of the amount of wages they receive during the two-month period in excess of $18,350 (and not greater than $110,100). The IRS will issue additional guidance as needed to implement the provisions of this new two-month extension, including revised employment tax forms and instructions and information for employees who may be subject to the new “recapture” provision. For most employers, the quarterly employment tax return for the quarter ending March 31, 2012, is due April 30, 2012. Medical Deduction for Breast Pumps: Breast pumps and supplies that assist lactation are considered to be medical care under IRC Sec. 213(d) because, like obstetric care, they affect a structure or function of a woman's body. If the remaining requirements of IRC Sec. 213(a) are met, expenses paid for breast pumps and supplies that assist lactation are deductible medical expenses. IRS Ann. 2011-14, 2011-9 IRB 532 . IRS Voluntary Settlement Program: A new Voluntary Classification Settlement Program (VCSP) allows taxpayers to reclassify workers as employees for future tax periods with limited federal employment tax liability for the past nonemployee treatment. To be eligible, the taxpayer must (1) have consistently treated the workers in the past as nonemployees; (2) have filed all required Form 1099's for the workers for the previous three years; and (3) not be under audit by the IRS, the Dept. of Labor, or a state agency. [For more on the VCSP, see NTA-783 (10/4/11).] The IRS has posted a series of FAQs, which clarify that participating taxpayers will pay 10% of the employment taxes, calculated under the reduced rates of IRC Sec. 3509(a) , for the compensation paid to the workers being reclassified during the most recent tax year. But, they will not be liable for interest or penalties, and the IRS will not share information about them with other agencies. Business Tax Provisions: According to a Congressional Research Service report dated 12/1/11, the following will expire on 12/31/11: (1) the research and development and the work opportunity tax credits; (2) the enhanced charitable deductions for contributions of food, books, and computer technology; (3) the special S corporation built-in gains tax suspension period; and (4) the 15-year recovery period for leasehold improvements, restaurant property, and retail improvements. Furthermore, the 100% bonus depreciation deduction will be scaled back to 50% in 2012, and the Section 179 deduction limit will fall from $500,000 this year to an inflation-adjusted $139,000 in 2012. Individual Tax Provisions: According to the same Congressional Research Service report, the following deductions will expire on 12/31/11: (1) elementary and secondary school teacher expenses, (2) state and local sales taxes, (3) mortgage insurance premiums, and (4) qualified tuition and related expenses. The 2010 Tax Relief Act allowed a taxpayer's nonrefundable personal credits to offset regular tax (net of any allowable foreign tax credit) and AMT for 2011, and also authorized a reduction in the employee's share of the Social Security payroll tax to 4.2% for 2011. Congress may extend the payroll tax break, and presumably will pass another (one year) AMT patch. Finally, the tax-free treatment of distributions from IRAs for charitable purposes will expire at the end of 2011. For all the risks that come with investing in 529 college savings plans in a period of market tumult, investors in most states have one certainty: that they'll receive state tax benefits for their contributions to their home state's plan. But those tax savings are much richer in some states than in others, as these figures for one hypothetical family show. Investors make roughly a third of their contributions to the state-sponsored 529 plans during the fourth quarter of each year, and most of that money comes rushing in during December as families look ahead to tax season, says Paul Curley, director of college-savings research at Financial Research Corp. in Boston. Most states offer a tax deduction. 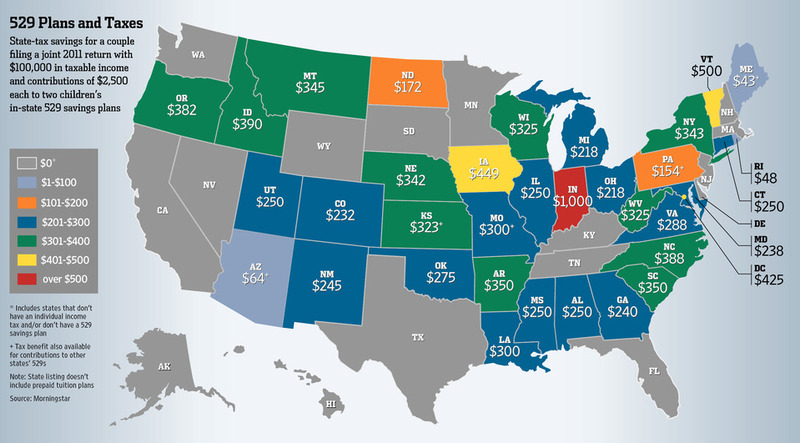 For one child, a married couple's annual write-off is capped at levels ranging from $250 (in Maine) to $26,000 (in Pennsylvania), says Joe Hurley, founder of Savingforcollege.com, which tracks 529 plans. Four states—Colorado, New Mexico, South Carolina and West Virginia—don't have annual deduction limits, but cap total deductions over time for each child. The limit can be as much as $318,000 (in South Carolina). For parents saving for two children's college education, the annual deduction caps in 10 states double. In Kansas, for example, it's $6,000 for one child or $12,000 for two. Instead of deductions, three states—Indiana, Utah and Vermont—give tax credits for a portion of 529-plan contributions. Sixteen states don't offer any tax benefits. To be sure, a few are states that don't have a personal income tax, such as Florida and Texas. But several of those states, including California, Hawaii and Minnesota, have high tax rates. Beyond tax benefits, some states are offering free cash in their 529 plans. While most have income limits, some give money just for starting a 529 plan. For example, Maine and Rhode Island offer $500 and $100, respectively, for parents who start a 529 plan before their child's first birthday. One drawback: Because the tax benefits are typically limited to plans sponsored by the taxpayer's state, that can stop people from choosing a different 529 plan with better-performing investments, says Deborah Fox, a San Diego-based financial planner and founder of Fox College Funding. The exceptions are Arizona, Kansas, Maine, Pennsylvania and Missouri, where residents can choose a 529 plan from any state while still receiving their own state's deduction. The IRS has issued guidance (Notice 2012-01) providing the 2012 standard mileage rates for taxpayers to use in determining the deductible costs of operating a car for business, charitable, medical, or moving expense purposes. The rate for the business use of an automobile is 55.5 cents per mile, the rate for the charitable use of an automobile is 14 cents per mile, and the rate for using an automobile for medical or moving purposes is 23 cents per mile. The guidance also provides the amount taxpayers must use in calculating a basis reduction for depreciation taken under the business standard mileage rate and provides the maximum standard automobile cost that may be used in calculating the allowance under a fixed and variable rate plan. The guidance is effective for applicable expenses, allowances, or reimbursements that are paid or incurred after December 31, 2011. The IRS requested comments in previous guidance (Notice 2010-88) on whether taxpayers should be allowed to use the business standard mileage rate for cars used in fleet operations. After considering one comment, and in light of the limited number of comments, the IRS won't change the current limitation on fleet operations. Governor Jerry Brown's (D) proposal to raise the sales tax by a half-cent and raise income taxes on high earners. Top rate would be 12.3 percent, up from the current 10.3 percent. Teachers' union "Courage Campaign" proposal to impose higher income taxes on top earners. Top rate would be 15.3 percent. Tom Steyer proposal to adopt single sales factor, taxing multistate companies based on their share of sales in California as opposed to their share of property or employees in the state. "Think Long" proposal that broadens the sales tax, lowers rates, and raises a large amount of revenue. Services would be taxed at 5.5%, taxes on goods would drop a half-cent, the top income tax rate would be 8.5 percent, and the corporate rate would drop from 8.84 percent to 7 percent. Molly Munger proposal to raise taxes across-the-board. California is a high tax state. They are sixth highest in state-local tax burden as a percentage of state income. The sales tax is the highest state rate in the country even before the recent 1% increase, and numerous county rates keep them in the top 5 of state-local combined rates. Their individual income tax top rate is the second highest in the country, eclipsed only recently by Hawaii, and is sixth highest in the country in terms of collections. The corporate income tax is one of the highest in the country and sixth highest per capita in collections. Even the gas tax is the third highest in the countryand the state Lottery has the fifth highest implicit tax rate in the country. Only on property taxes is California "low": 28th highest in collections per capita. With these comparisons, and the enormous growth in state spending, it's hard to say that California's problem is insufficient taxation. Ultimately, California voters need to decide whether they are willing to pay the taxes to fund the programs they want. The tax system prevents this from happening now, due to the state's overreliance on taxing capital gains, corporations, and high-income earners. Most Californians rightly think additional spending is a free lunch that they won't have to pay for. Will we have Bonus Depreciation in 2012? Yet another incentive set to expire at the end of 2011 is 100 percent bonus depreciation. Projects are eligible for that form of accelerated depreciation if they are placed in service by December 31. It is unclear whether the provision will be extended, but Gimigliano said the possibility remains, pointing to President Obama's call to extend the provision as well as Republicans' belief that bonus depreciation is "the holy grail" of tax incentives. Nonetheless, accelerated depreciation in general could be eliminated under comprehensive tax reform, and it remains uncertain how effective bonus depreciation has been in encouraging growth, he said. Q: Does a real property tax need to be ad valorem in order to be deductible as an itemized deduction? A: Yes. A real property tax needs to be ad valorem in order to be deductible under Internal Revenue Code section 164, to which California law is fully conformed. Further, taxpayers may not deduct assessments (whether assessed on an ad valorem basis or otherwise) for local benefits (such as street, sidewalk, and other like improvements) of a kind tending to increase the value of the property assessed that are imposed because of and measured by some benefit inuring directly to the property against which the assessment is levied. These nondeductible amounts may be added to the basis of the property in accordance with Internal Revenue Code section 1016 and the applicable regulations. Federal law does, however, provide that the portion of the above-discussed assessments for local benefits that are made for the purpose of maintenance or repair, or for the purpose of meeting interest charges with respect to those local benefits, are deductible. Federal regulations provide that the burden is on the taxpayer to show that a portion of the amount assessed is allocable to these purposes. If the allocation cannot be made, the federal regulations provide that none of the amount so paid is deductible. Finally, a 2003 IRS Office of Chief Counsel Memorandum provides the apparent basis for a conclusion that assessments may be deductible as real property taxes even though they are not imposed on an ad valorem basis. However, this was an internal memorandum drafted by a local IRS attorney which is inconsistent with published federal guidance, should not be considered written advice, and, according to conversations with IRS Office of the Chief Counsel, does not reflect the official position of the IRS. This internal memorandum has never been released nor made available by the IRS and the conclusion expressed in it has never appeared in any IRS ruling, written advice, publication or guidance. If your firm recently has been visited by an IRS or state tax auditor, you’re not alone. More than three-fifths of corporate tax execs surveyed in October by KPMG LLP indicated that activities stemming from federal tax disputes had increased over the past year. In addition, 37 percent indicated that the number of state tax audits had jumped. From the IRS’ perspective, the heightened enforcement activity is working. In fiscal year 2010, revenue from enforcement sources topped $57 billion, up 18 percent from fiscal 2009. At the state level, dropping tax collections appear to be prompting state tax officials to heighten the audit efforts. According to a March 2011 report from the U.S. Census Bureau, “State Government Tax Collections Summary Report: 2010,” the amount of money collected through taxes declined two percent between fiscal 2009 and 2010, dropping from $718.9 to $704.6 billion. Indeed, many state budgets are dropping as well. Of 32 states that had enacted 2012 budgets as of June, 2011, 24 included significant cuts, reports the Center for Budget and Policy Priorities. The heightened audit activity is likely to continue or even intensify, the execs in the KPMG survey said. More than two-thirds expect the number of federal audits to increase, while more than half said they expected the same for state tax audits. Additionally, one-quarter of the respondents expect regulators from outside the U.S. to increase their audit efforts, as well. Given that the focus on audit activity appears unlikely to settle down any time soon, corporate tax execs “should regularly review their accounting methods, tax returns, risk assessments, and other processes and take the time to identify the documents, people, time and resources that might be needed to handle a potential tax audit,” said Sharon Katz-Pearlman, principal-in-charge of KPMG LLP’s Tax Controversy Services practice, in a statement on the survey. More than six million children in the U.S. fall into the "special needs" category, and their ranks are expanding. The number of those affected by one developmental disability alone—autism—grew more than 70% between 2005 and 2010. The tax code can help—if you know where to look. There are numerous tax breaks for education, but the most important one for many special-needs students isn't an education break per se. Instead, it falls under the medical-expense category. Nov 7 (Reuters) - Credit Suisse AG, Switzerland's second-largest bank, has begun notifying certain U.S. clients suspected of offshore tax evasion that it intends to turn over their names to the U.S. Internal Revenue Service, with the help of Swiss tax authorities. Credit Suisse's notification by letter, a copy of which was obtained on Monday by Reuters, says the handover of names and account details will take place following a recent formal request for the information by the IRS. The move by Credit Suisse to disclose American client names and account information is the latest twist in a showdown between Switzerland and the United States over the battered tradition of Swiss bank secrecy. U.S. authorities, who suspect tens of thousands of wealthy Americans of evading billions of dollars in taxes through Swiss private banks in recent years, are conducting a widening criminal investigation into scores of Swiss banks, including Credit Suisse. The letter, on Credit Suisse letterhead, is dated Nov. 2, comes from the bank's Zurich headquarters and is signed by two senior Credit Suisse executives. It cites a formal request made by the IRS to the Swiss Federal Tax Administration, or SFTA, via a tax treaty between the two countries. Seeking information. "The IRS is seeking information with regard to accounts of certain U.S. persons owned through a domiciliary company (as beneficial owners) that have been maintained with Credit Suisse AG," the letter said. It added that the recipient of the letter, whose name was redacted in the copy obtained by Reuters, fell into the category of clients sought by the IRS. Domiciliary companies are a type of shell company. "In connection with the IRS treaty request, the SFTA has issued an order directing Credit Suisse to submit responsive account information to the SFTA," the letter said. "This order is immediately executable and Credit Suisse as an information holder has no right to appeal." It was unclear how many U.S. clients had been sent the letter. David Walker, a spokesman for Credit Suisse, declined to comment on the matter. The letter says that the IRS request covers accounts maintained at any time over the period from Jan. 1, 2002, through Dec. 31, 2010. The letter was signed by Michel Ruffieux and Stephan Gussman, both managing directors at Credit Suisse. Credit Suisse in July received a target letter from the U.S. Justice Department notifying it that it was the subject of a federal criminal investigation into its offshore private banking services. Switzerland is trying to craft a deal with the United States that would cover its entire banking industry of some 355 banks. It is unclear how many American clients of Credit Suisse hold private banking accounts that have gone undeclared to U.S. tax authorities. Two choices. The Credit Suisse letter gives the client two choices: either agree in writing to the turnover of the client's data to the Swiss tax authorities, which will then forward it to the IRS, or hire a lawyer in Switzerland and contest the process. Under U.S. law, contesting a handover requires the American client to inform the U.S. attorney general that he is doing so — a move that effectively discloses the identity of the suspected tax evader to U.S. authorities. Switzerland has broadly interpreted its tax treaty with the United States to mean that the United States must generally already possess the names of suspected American tax evaders in order to gain further information on their Swiss bank accounts. Switzerland recently showed signs of softening on that interpretation. In August, Swiss government officials said they would consider processing treaty requests based on "behavioral patterns," as opposed to concrete names. Many Swiss banks turned over broad statistical data, meaning behavioral patterns, for their American clients in September, following a request from the U.S. Justice Department's second in command, Assistant Attorney General James Cole, to do so. Scott Michel, a tax lawyer with Caplin Drysdale in Washington, D.C., said that the letter could mean one of two things: either the United States was taking softer steps to bolster the thrust of its target letter to the bank, or Credit Suisse was in the process of reaching a settlement with U.S. authorities. Such a settlement, following the receipt of a target letter, would typically be a deferred-prosecution or non-prosecution agreement. He said the fact that the Swiss tax authorities had ordered Credit Suisse to provide it the data to hand over to the IRS represented "a further erosion of longstanding Swiss bank secrecy." Many employees receive stock options as part of their compensation packages. From a tax standpoint, there are two kinds of options—statutory and nonstatutory. “Incentive stock options,” or ISOs, as they are commonly known, are statutory options, because they are specifically provided for in the Internal Revenue Code and are subject to numerous qualification requirements. Options that don't meet these requirements are nonstatutory stock options or NSOs (also known as nonqualified stock options or NQSOs). Both kinds of options have tax advantages, but there are quite a few differences between them. Here's some basic information on the taxation of compensatory stock options that may help you better understand how best to benefit from them. Option grant: If you have ISOs, you are not taxed on option grant. The same is generally true of NSOs. An NSO is taxed at grant only if it has a “readily ascertainable” fair market value (FMV), which is seldom the case. IRS rules say that an option doesn't have a readily ascertainable value at grant unless: (1) the option is actively traded, or (2) (i) the option is immediately transferable; (ii) the option is fully exercisable; (iii) the option and the option stock are unrestricted; and (iv) the value of the “option privilege” is readily ascertainable. In the unlikely event that an NSO is taxable at grant, you have compensation income at that point. The deferred compensation rules under Code Sec. 409A —which tax deferred compensation to the extent not subject to a “substantial risk of forfeiture” unless specific requirements are met—don't apply to the grant of an ISO. However, these rules can apply to the grant of an NSO, unless the exercise price can never be less than the underlying stock's FMV on the date the option is granted and certain other conditions are met. Any remuneration that arises when stock is transferred on the exercise of an ISO isn't subject to FICA or FUTA taxation. When you exercise an NSO that wasn't taxed at grant, you're taxed at ordinary income rates on the difference between the value of the option stock at that time and the price you paid for it (plus any price you may have paid for the option, although generally that will be zero). This is compensation income that is subject to payroll taxes and income tax withholding. Taxes may be withheld from your salary or other compensation income, or you may have to sell some of the stock to cover the withholding or make some other arrangement with your employer. However, if the option stock is nontransferable or subject to a substantial risk of forfeiture, then you aren't charged with compensation income until those restrictions no longer exist. In that case, you can choose to pay tax on exercise so that all gain from that point on would be capital gain. Sale of option stock: When you sell ISO stock, you generally are taxed at favorable long-term capital gain rates on the difference between the price you paid for the stock and the amount you realize on its sale. However, if you sell the stock within two years of the option grant or within one year of the option exercise, you're hit with compensation income to the extent of your bargain element at exercise. The balance of your gain is capital gain, which will be taxed at favorable rates if you've held the stock for more than one year on the sale date. It's important to know how long you need to hold the stock to qualify for long-term capital gain rates on the difference between the price you paid for the stock and the amount you realize on its sale or, if you don't hold the stock long enough for this favorable tax treatment, how much additional compensation income will be attributed to you. We can determine this from information on a statement from your employer. You should receive this statement by January 31 following the close of the year in which you exercised the ISO. If the option was exercised after October 22, 2004, any income on disposition of the stock isn't subject to FICA or FUTA taxation. Additionally, any income resulting from a disqualifying disposition of stock acquired under an ISO isn't subject to withholding. When you sell stock acquired by exercise of an NSO, you have capital gain if you were subject to tax either at option grant or exercise, or when restrictions on your option stock lapsed. Otherwise, you have compensation income at the time of the sale. Gifts of options: Some people would like to give stock options to family members as part of their overall estate planning. Transferring property before it increases in value helps lower or eliminate estate and gift taxes. This can't be done with ISOs, because they can't be transferred during the optionee's lifetime and can't be exercised by anyone but the optionee during his or her life. NSOs have an edge here if the option plan allows options to be transferred to family members, as many plans now do. However, the IRS has ruled that an option transfer isn't complete for gift tax purposes until the option is no longer conditioned on the performance of future services. That usually means that the gift will be subject to gift tax at a time when the option's value has increased. The IRS also has issued some complicated rules for valuing gifts of NSOs. For income tax purposes, a gift of NSOs to a family member isn't a disposition that triggers tax. Instead, the employee will be taxed when the transferee exercises the options. As you can see, the tax rules for compensatory stock options are quite complex. Please call for an appointment if you have additional questions about your options, or if you would like to do some tax planning for them.